Steven (Chicagoland, United States) on 26 September 2016 in Landscape & Rural and Portfolio. Cette arche taillée dans la pierre est impressionnante. Très belle prise de vue , cette route 12 est bien belle ! What a good working moment to take the shot ! A so particular scene! Beautiful job! I have to say, that Scenic Byway, is about right. It must be wonderful to drive along this road. Excellent image. Good shot of the tunneled out rock. Yeah, worth driving through the tunnel ! In America preserved the mountain and made a tunnel, here in Portugal, have brought down part of the mountain. In many of our constructions of roads, never was the idea of preservation, only the idea of destruction. Never a dull moment on this scenic route, for sure.... the beauty of it all keeps you alert to see what lies ahead. Carving out a tunnel in that rock was a fabulous idea. Beautiful! Cet arbre au sommet ce rendu rouge sur la roche et le camion qui passe superbe. A cool capture of the highway passing through the red rock. Love the colors. I love the earthy tones. What a fabulous view of the road and "tunnel"
Excellent job, I like 't. Brings back lots of memories! Have been there many times. Vraiment super ce tunnel ! Wonderful point of view with the curve in the road and the tunnel! There seems hardly enough road for two cars to pass much less a truck! Gorgeous colors! excellent shot. 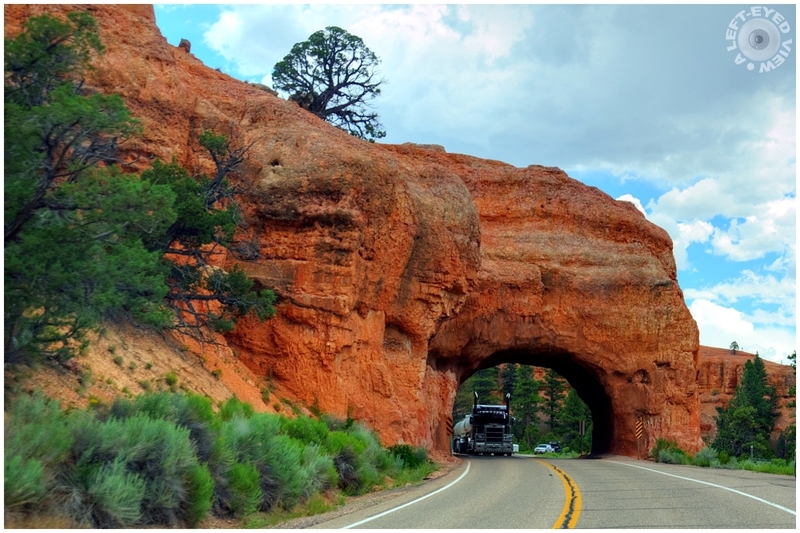 wonderful depiction of the rocks and road and smart inclusion of the truck passing under the arch. Though I am not as crazy about the trailing cars. That is a gorgeous piece of rock. The truck really adds to the shot. The colour and detail of the rocky arch are superb! Amazing to see how the natural can work with man made.